Thomas Hughes Barlow was born about 1856, son of John and Elizabeth Barlow. He and his wife Elizabeth had at least two daughters and a son. 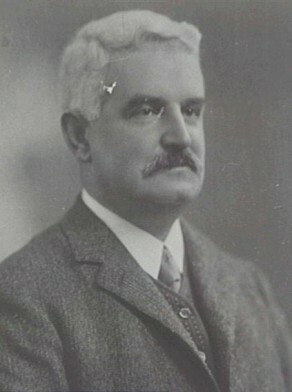 Thomas Hughes Barlow died at his North Sydney residence in 1926. Thomas and Elizabeth Barlow and their daughter Mary arrived in Sydney as unassisted immigrants on 21 September 1882 on the Peterborough. An infant daughter Ethel died on the voyage. Barlow’s occupation at that time was tailor. By 1905, Thomas H Barlow, JP, was living at ‘Dernford’, Lytton Street, North Sydney. Thomas Barlow was Alderman for Phillip Ward, 1 December 1898 to 30 November 1918. He was a member and Vice-Chairman of the Parks and Recreation Committee, 1903, member of the General Purposes Committee, 1898-1918, the Electric Lighting Committee, 1899-1902, the Finance Committee, 1899-1900, 1904, 1906, 1915-18, the Garbage Disposal Committee, 1899, the Health Committee, 1901-02, the Works Committee, 1903, 1905-06, 1910-17, the Health and By-Laws Committee, 1904, 1906-07, 1909-14, 1918, and the Street Signs Special Committee, 1906. Barlow was also the City member of the Board of Water Supply and Sewerage, from 1910 until 1918.